Fucus vesiculosus has a number of morphological adaptations that are extremely beneficial. First, the organism has evolved what is called a holdfast. This is root-like structure that connects the entire organism to the substrate or ground. The holdfast ensures that the organism doesn't float away from an area that it has evolved to thrive in, for example, moving from an area of lower temperatures to higher temperatures, and also changes in the salinity of the water. 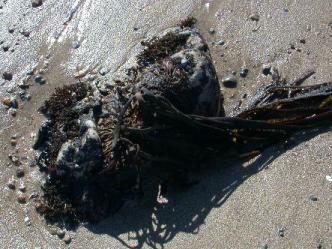 The picture to the right shows a holdfast of another brown algae. Notice the root-like structures that are all over the substrate. Bladderwrack has also evolved to be somewhat of a specialist in surface area to volume ratio. The alga has extremely flat blades that allow it to soak up as much sunlight as possible without having to sacrifice many nutrients, which would be the case if more cells were present in the blade. This flat morphology also allows local production of sugars, and also allows for the plant to simply get its water through osmosis. This is the reason why Bladderwrack hasn't evolved vascular tissue like the plants have. The reason for the brown color? There is also a special pigment that has evolved in Fucus vesiculosus that allows for a greater absorption of light, fucoxanthin. This extra absorption makes photosynthesis a lot more efficient. You can find out more about photosynthesis and Bladderwrack's source of nutrients by going to the nutrition page. As was stated on the home page, F. vesiculosus is known for the air bladders found in pairs on its blades. These bladders help keep the brown algae afloat when the tide comes in so photosynthesis can continue at a more productive rate. The bladders are filled with mostly O2 that is a product of photosythesis. The bladders are held together by a network of white filaments, that as the organism gets older, break, and leave the bladder incapable of holding any gases. After only a couple years, F. vesiculosus will only have bladders towards the younger end of the thallus. Bladderwrack has quite a few predators since it is a primary producer. 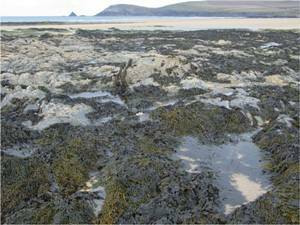 Fortunately enough for bladderwrack, however, is it has developed a way to prevent this herbivory. Fucus vesiculosus has developed a certain set of compounds called phlorotannins. Scientists have found that this resists grazing from herbivores by looking at the lower levels of damage of a bladderwrack thallus with higher levels of phlorotannins relative to thalli that have lower levels of these compounds. Fucus vesiculosus inhabits a place where the waves can be especially harsh. Waves can smash the thalli against rocks and other algae in the area, which can cause damage to the bladders and the organism as a whole. To prevent damage from this constant motion while submerged and battering against other objects, F. vesiculosus has developed gel-forming polysaccharides that helps cushion the thallus of the organism. These polysaccharides also help prevent desiccation when low tide comes and the organism is subjected to harsh rays from the sun.